Chen, Z, RT Corlett, X Jiao, . . . R-C Quan. 2018. Prolonged milk provisioning in a jumping spider. Science 362:1052-1055. Summary. Mammal-like milk production and maternal care have been discovered in the ant-mimicking jumping spider Toxeus magnus. Young of this species remain in the nest with their mother for about three weeks, and continue to feed on milk until about five weeks of age. Spiderlings were observed ingesting a liquid produced from a groove in the mother’s abdomen. Analysis of this fluid revealed it is rich in nutrients, with a protein concentration four times that of cow’s milk. Spiderlings that were denied milk on hatching died after about ten days. Denial of milk at the end of three weeks reduced spiderling survival rate and body size. Normally, spiderlings stopped drinking the milk after 5-6 weeks, and became fully independent. Maternal presence was important for survival in ways other than milk production. For example, when mothers were removed at three weeks of development, survival rate was reduced, but not body size. It is likely that mothers play an important role in keeping the nest clean and free of parasites. Although some other examples of maternal care are known in invertebrates, this is the first report of invertebrate milk production. Comments. 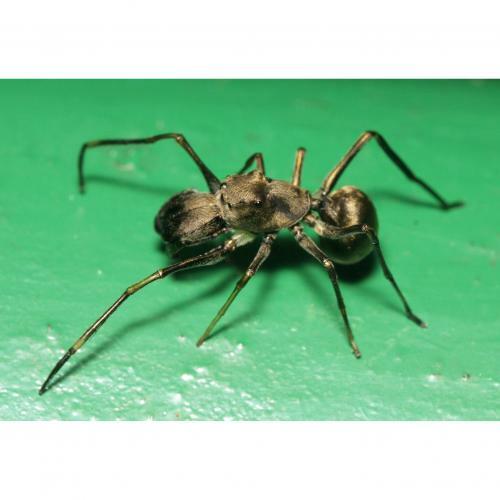 Milk production and nutrition in a spider is unexpected and this discovery exemplifies the danger of assuming that a single representative of a group provides an adequate understanding of the entire group.. The genus Toxeus includes eleven species of jumping spiders living in Asia, from India to the Philippines. [i] The species studied, T. magnus, lives in China and Taiwan. Other species in this genus should be investigated for possible milk production. The necessity of the milk for development and survival of the young spiders is reminiscent of the need for milk in young mammals. From an evolutionary perspective, similar traits in totally different types of creatures is unexpected. Such so-called “convergences” challenge the common belief that species with similar traits must have inherited them from a common ancestor. An interesting alternative explanation from a creationist perspective is that creatures were created using functional modules, such as milk production, that were combined in various ways to produce different kinds of organisms. [ii] Such modules need not have the same genetic basis, but would be similar in function. In this perspective, similar traits in unrelated species may be due to design by a common Creator. This episode explores where the amazing creatures we observe in the world today came from. Did they evolve? Were they all created by God in the Garden of Eden? Did Noah build a boat that held everything from spiders to Elephants? Are some of the claims made in the Bible even possibly true given what we know from our scientific study of organisms? This episode carefully examines what the Bible actually claims about organisms and the flood; and what we believe to be true, based on current science, about organism’s ability to adapt to a changing environment.